It's not too early to start planning to attend the Annual Safe & Civil Schools National Conference next summer in Portland, Oregon! Our 14th Annual National Conference is scheduled for July 18–22, 2010 at the historic Benson Hotel in downtown Portland. We'll post information on our website as it becomes available. This past summer, Arne Duncan and President Obama announced preliminary guidelines for the Race to the Top fund. Race to the Top encourages states to reform their educational practices by funding innovative and effective strategies to achieve significant improvement in student outcomes—i.e., increasing student academic achievement, keeping students in school until they graduate, reducing the achievement gap, and so forth. Safe & Civil Schools can help you implement innovative educational practices, grounded in effective, evidence-based strategies, that will help you achieve the outcomes advanced by Race to the Top grants. More information about the Race to the Top can be found on the Department of Education's website. More information about how Safe & Civil Schools can help you in your "Race to the Top" can be found on our website. "Well, it seems to be official that this first week has been the smoothest most of us have seen in several years. I attribute it to CHAMPS and the positive attitude from all the staff. Yes, the 6th graders came in seeming to know/behave better. But without CHAMPS, even these good students would change. I'm beginning to see some "adolescent" stuff but it's sooo much better than in the past and the students respond to light correction! I'm amazed, impressed, and glad I decided to give Bussey another year. I really love being here and the people I work with. I go home tired but more energized." Congratulations to the Bussey Middle School community! Even if they don't know it yet, your students appreciate your efforts on their behalf. And, thanks for letting us know how things are going with your CHAMPS implementation! The Tough Kid Tool Box contains a comprehensive set of tools and materials that teachers can use to manage and motivate the tough-to-teach student. Tough Kid New Teacher is a practical, easy-to-use guide for new teachers that helps them manage student behavior in even the most challenging classroom. Both books are effective in grades K-12. Watch future newsletters for Tough Kid Bully Blockers Shorts, an entertaining take on strategies that work for challenging students. Visit the Pacific Northwest Publishing website for information about other books and materials for educators on Positive Behavior Support strategies and Behavioral Response to Intervention. Safe & Civil Schools will be exhibiting at the NASP 2010 Annual Convention next spring in Chicago. The convention will take place from March 2–6, 2010 at the Hyatt Regency Chicago. Safe & Civil Schools staff will be in the Exhibit Hall in Booth 119. Stop by and visit! In August 2008, the Institute of Education Sciences (IES) released a practice guide on dropout prevention, offering recommendations for school personnel to follow in their efforts to help students stay in school. Download the practice guide and read a brief article on the alignment between the Safe & Civil Schools instructional model and these IES policy recommendations. Although illegal in 30 states, corporal punishment continues to be used as a means of disciplining students in 20 states. According to a recent report, Impairing Education, published jointly by the Human Rights Watch and the American Civil Liberties Union (ACLU), approximately 223,190 children were paddled in American schools during the 2006-07 school year. Inflicts needless physical, psychological, and emotional pain. Creates an atmosphere of fear and mistrust for many students, not only those who receive the punishment. Discriminates against students of color. Discriminates against students with disabilities. May contribute to a student�s decision to drop out of school. As noted in these reports, current research on corporal punishment refutes its effectiveness in changing inappropriate student behavior. Yet the practice has long-lasting adverse affects on society in general. Corporal punishment perpetuates violence in our culture by sending the clear message that adults think hitting is appropriate. At Safe & Civil Schools, we think along the lines of, �Spare the rod, teach the child.� Models of Positive Behavior Support (PBS) do just that. The research literature on PBS indicates that prevention and positive feedback are more effective in managing student behavior than strictly reactive techniques such as corporal punishment. The old adage, �You can catch more flies with honey than with vinegar,� loosely summarizes the principal on which Positive Behavior Support is based. Students respond positively to respectful treatment and negatively to degrading treatment. Structure your classroom for success. The way the classroom is organized (physical setting, schedule, routines and procedures, quality of instruction, and so on) has a huge impact on student behavior. Effective teachers thoughtfully structure their classrooms in ways that prompt responsible student behavior. Teach behavioral expectations to students. Effective teachers explicitly teach students how to behave responsibly and respectfully (in other words, to be successful) in every classroom situation — teacher-directed instruction, independent seatwork, cooperative groups, tests, and all major transitions. Observe and supervise. Effective teachers monitor student behavior by physically circulating whenever possible and visually scanning all parts of the classroom frequently. Effective teachers also use meaningful data to observe student behavior, particularly chronic misbehavior, in objective ways and to monitor trends across time. Interact positively with students. Effective teachers focus more time, attention, and energy on acknowledging responsible behavior than on responding to misbehavior�what we call a high ratio of positive to negative interactions. When students behave responsibly, they receive attention and specific descriptive feedback on their behavior. Correct fluently. Effective teachers preplan their responses to misbehavior to ensure that they respond in a brief, calm, and consistent manner�ensuring that the flow of instruction is maintained. In addition, with chronic and severe misbehavior, teachers think about the function of the misbehavior ("Why is the student misbehaving?") and build a plan that helps the student learn appropriate behavior. Only the fifth and last strategy—Correct fluently—is reactive. The first four strategies—Structure, Teach, Observe, and Interact positively—describe techniques effective teachers use proactively to prevent misbehavior before it occurs. To accomplish true behavior change, the proactive strategies (Structure, Teach, Observe, and Interact positively) must be implemented. When it is necessary to Correct fluently, we can recommend procedures that are effective and do not include the adverse consequences of corporal punishment. 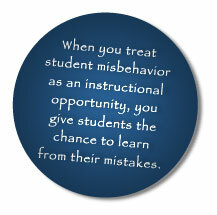 A certain amount of misbehavior is bound to occur in any classroom. The trick is learning to respond in ways that lead to fewer occurrences of the inappropriate behavior. Correcting fluently is such a response. Changes the future occurrence of the behavior. The correction reduces the chance that the student will exhibit that behavior in that situation in the future. Does not disrupt other students. In other words, the correction is fluent. The teacher�s response does not stop the flow of instruction and does not distract other students from the work they are doing at the time the student misbehaved. Treats the student who misbehaved with dignity and respect. Teachers should never belittle their students. Does not reduce the student�s motivation to exhibit positive behaviors. Imagine a high school coach whose corrections inspire all players to want to work even harder in the future. Does not jeopardize the positive relationship between teacher and student. Throughout the correction, the teacher must convey fondness, caring, and high expectations for the student—both academically and behaviorally. (For more in-depth procedural information, see CHAMPS, 2009). Correcting fluently is a strategy that can help you rectify misbehavior in a manner that helps the student whose behavior is chronically problematic, reduces the degree to which that student�s behavior interferes with the learning of others, and makes it easier for you, as teacher, to feel more effective, useful, and valued in your classroom. STOIC, with its proactive and corrective procedures, can actually accomplish more toward changing student behavior than corporal punishment. This follows from the many studies that show students respond positively and productively to teachers who take the time to build warm and trusting relationships with them, who treat them with dignity, and who punish fluently, consistently, and fairly. More information about setting up a classroom management plan based on tenets of Positive Behavior Support is available in CHAMPS: A Proactive and Positive Approach to Classroom Management, Second Edition. Chapter 9 deals extensively with correcting severe and chronic misbehavior and elucidates the information presented here. On August 11, 2009, the New York Times wrote a balanced article, "Disabled Students Are Spanked More", on the HRW/ACLU report cited above. The next day, Time released an article, "Corporal Punishment in U.S. Schools", that provides a succinct summary of the HRW/ACLU report. As a counterpoint to the HRW/ACLU report, Newsweek published "The Principal and the Paddle", describing the efforts of a South Carolina principal to curtail misbehavior in his school by paddling students. The article shows how this principal has turned his school around with his methods. The website for the Center for Effective Discipline offers articles, videos, and research on corporal punishment, both at home and in schools. Interesting pages on this site are Facts Vs. Opinion: School Corporal Punishment and The Paddle and the Damage Done. To download copies of the two HRW/ACLU reports, visit this page.